Alchemy is the ancient art and science of attempting to transmute base metals into gold and silver. For centuries alchemists carefully guarded their secret knowledge from the masses encoded in vivid manuscripts filled with strange glyphs, mythical bests, and obscure language. 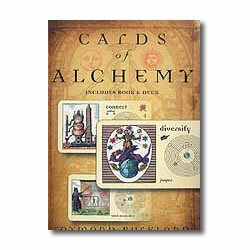 Set includes 50 full color cards and 240 page book.